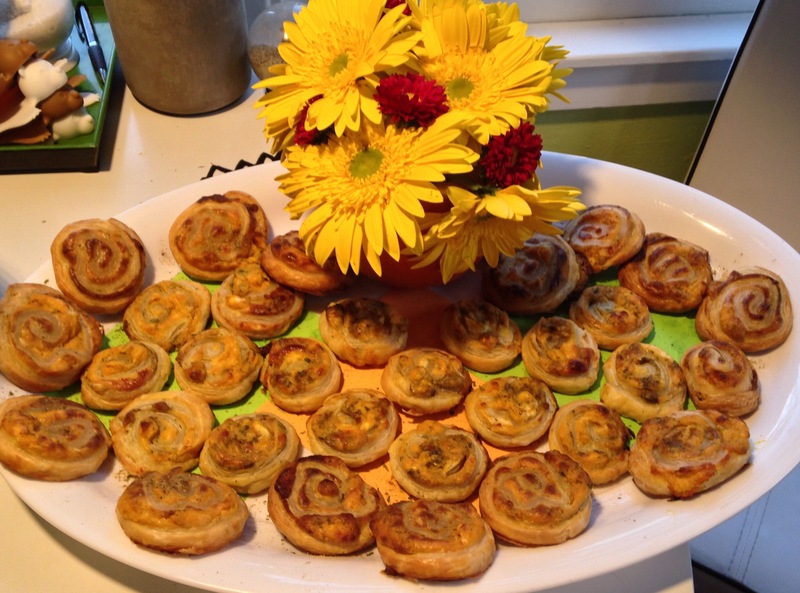 Do you need an appetizer in a pinch? These will get gobbled up at any Thanksgiving gathering! Slice them frozen and bake them off at the party or make just as you are heading out so they stay warm, best eaten warm. 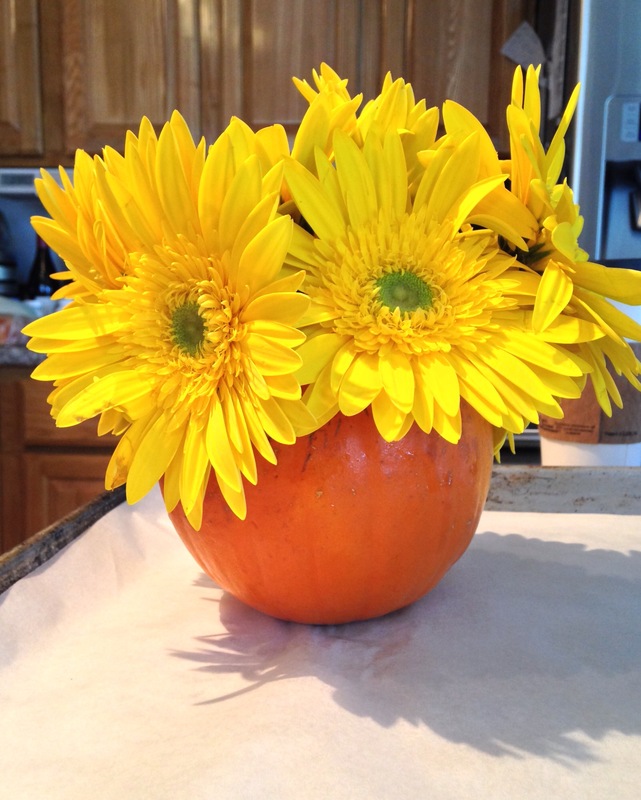 Also for a cute and speedy floral arrangement, hollow out a mini pumpkin, line with foil. Add a few florets and there you have it! Preheat oven to 400° F Line a cookie sheet with parchment or non stick foil. In a medium bowl, stir together the pumpkin purée and cream cheese, set aside. Unwrap puff pastry , if it comes rolled in parchment just un roll it on the parchment or place on a clean, lightly floured counter or work surface. 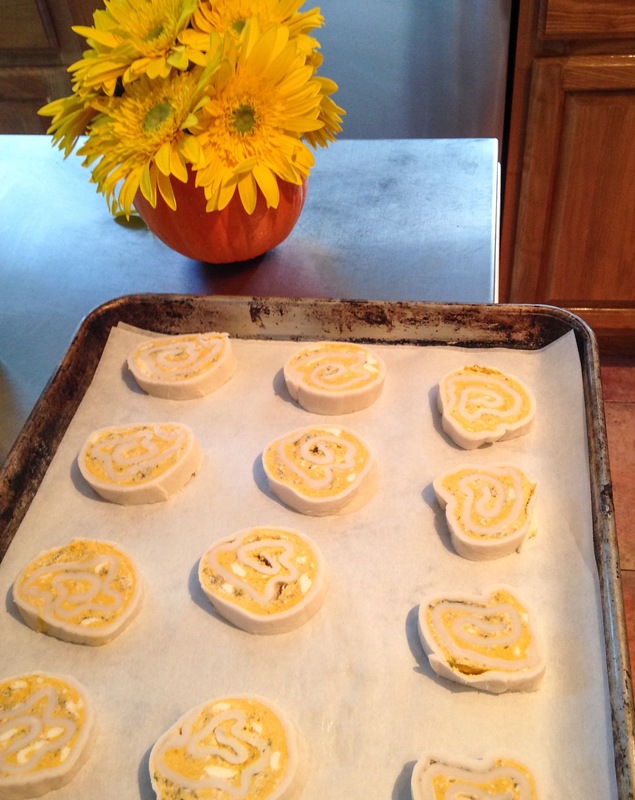 Spread pumpkin and cream cheese mixture over the puff pastry, leaving a half-inch margin on all sides. Sprinkle seasoning blend evenly over the top. Evenly sprinkle Parmesan cheese over the top. Roll up the puff pastry in an as-tightly-wound cylinder (log) as possible. Wrap log with plastic wrap and freeze until almost frozen. Unwrap log with a very sharp knife slice the log into 12 equal-size pieces. Let thaw on cookies sheet until very cold but not totally frozen. In a small bowl, lightly beat together the egg and water to create an egg-wash. Brush egg-wash over pastry slices, distribute evenly until it’s gone. Bake for about 20-30 minutes, or until puffs are golden, puffed, set and done. Allow puffs to cool in pan for about 5 to 10 minutes before removing. Serve immediately.